Baritone Ukulele completed at last!!!!!! If you read the interview that Keith ( ocarolan ) kindly did with me, you might remember an incomplete baritone ukulele? After starting it about 6 or 7 years ago, I thought it high time to finish it off. As I’ve said before, my baritone ukes are just not economically viable for me to build. It’s very much built as a small classical guitar; it’s fan-braced, dovetail neck joint, double hole bridge etc. So, although this instrument isn’t a commission, I’ll probably hang on to it for a while unless someone makes me an offer I can’t refuse! Congrats on finally finishing it Gary! Hope someone will give it a good home - far too nice an instrument to languish on the wall gathering dust! Last Edit: Mar 17, 2019 17:44:24 GMT by ocarolan: o! Sound lovely but I take your point about the work involved! They’re fantastic to noodle away on whilst sat watching TV, and not loud enough to be antisocial. 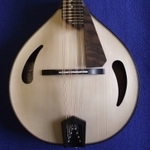 The work that goes into making them is the same as a guitar, but as you imply people expect a smaller instrument to be lower cost, unfortunately. I’m missing having one for myself, so another may be on the way.